MEGA-MIX MANGANESE is a concentrate aqueous solution of Manganese that has twice the solubility on a metal basis as Manganese Sulfate at zero degrees C and is designated to give one of the highest Manganese solubilities available. Since Manganese is most easily assimilated by plants and turf, it is effective as a foliar spray and on turf to correct and prevent Manganese deficiency. An essential micro element, Manganese functions as part of the enzyme system in plants and can be affected by high organic soils, high pH soil, soil moisture and imbalances between Calcium, Magnesium and Iron. 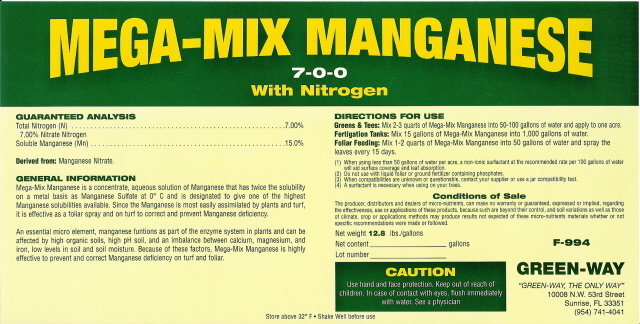 Because of these factors, MEGA-MIX MANGANESE is highly effective in preventing and correcting Manganese deficiency on turf and foliar.